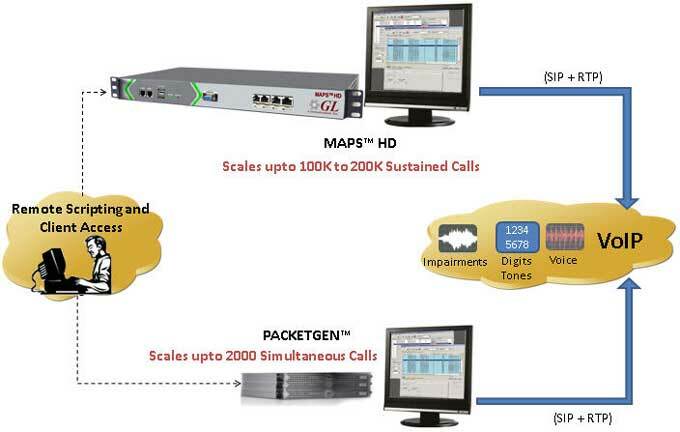 Gaithersburg, Maryland, USA - April 05, 2013- GL Communications Inc. announced today its enhanced PacketGen™ software - a PC-based real-time VoIP bulk call generator, with both SIP signaling and RTP generation. Speaking to reporters, Mr. Karthik Ramalingam Senior Manager for Product Development of the company said, "PacketGen™ is based on a distributed architecture with SIP and RTP software cores modularly stacked in one or many PCs to create a scalable high capacity test system capable of generating 2000 simultaneous calls." He added, "PacketGen™ can be used to test basic functionality and verify proper protocol implementation in SIP based equipment such as SIP phones and Network Servers, Proxy Servers, Registrar Servers, and PSTN and Media Gateways. And it has now been enhanced with many features that include: high-density performance, additional codec support, multi-frame interval, media re-negotiation, and more." Mr.Ramalingam further added, "Enhanced PacketGenTM with its newly added features provides great value in both SIP signaling and RTP generation to VoIP user community,"
PacketGen™ on an i7 PC can now support 2000 simultaneous calls with both SIP and RTP generation. This performance is with a G.711 codec, while other codecs may provide higher call densities. The distributed architecture of PacketGen™ allows achieving higher call rates and media streams, and provides greater scalability i.e. easy to add additional load generation capacity. For comprehensive understanding of the product, please visit PacketGen™ web page.